Today we get word from Variety that Stephenie Meyer’s novel The Host has been acquired by producers for adaptation to the big-screen. The 600-plus page science fiction-romance novel is the first adult novel written by Meyer. Producers Nick Wechsler, Steve and Paula Mae Schwartz have used their own money to acquire the screen rights to Meyer’s The Host. The book is, “a love story set in the near future on Earth, which has been assimilated by an alien species of benevolent parasites that call themselves “Souls.” One such soul, the Wanderer, is fused with a dying human named Melanie Stryder, in an attempt to locate the last pocket of surviving humans on Earth.” The adaptation is set to be written and directed by Andrew Niccol (Gattaca and The Truman Show). Variety reports that the producers have been trying to acquire The Host for a while now, lobbying Meyer and her UTA reps with “a significant offer, a strong vision for the project and a collaborative spirit.” Meyer eventually said yes to them (persistence CAN work). Writer/director Niccol came into consideration for the adaptation when Meyer was asked what her favorite sci-fi movies were, with a couple of the replies being Gattaca (which Niccol wrote and directed) and The Truman Show (which Niccol wrote). Do you like The Host, and if so, what do you think of a movie being made out of it? No release date has been set for The Host as of yet. I saw this. 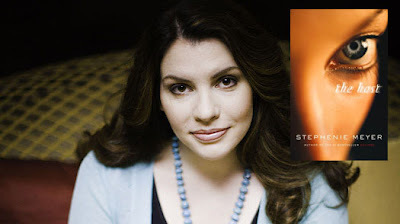 Stephenie Meyer fans are pretty excited! I have not read The Host and probably won't. I LOVED the Twilight Saga. I loved The Host. I am really excited that it will be made into a movie! Can't wait!!! I really enjoyed the book! I haven't read the book yet. I guess I better get to it! I really liked The Host, even though I didn't think I would particularly. I can't imagine how they're going to achieve getting that story onto the screen though. Can you believe I haven't read it yet? I'm so ashamed! I am excited for her though. I can't wait! i'm really excited for this even though i didn't think the book was spectacular. I have a feeling the story will play out better in movie form...can't wait to see who they cast!